Deepa Mehta’s screen adaptation of of Salman Rushdie’s modern day classic novel Midnight’s Children is due for release nationwide in the UK on Boxing Day. It tells the story of young boy named Saleem Sinai, who was born at the stroke of midnight on India’s independence from the British. Saleem is born with special telepathic powers and his journey mirrors that of a turbulent new nation finding itself in the aftermath of a painful partition. 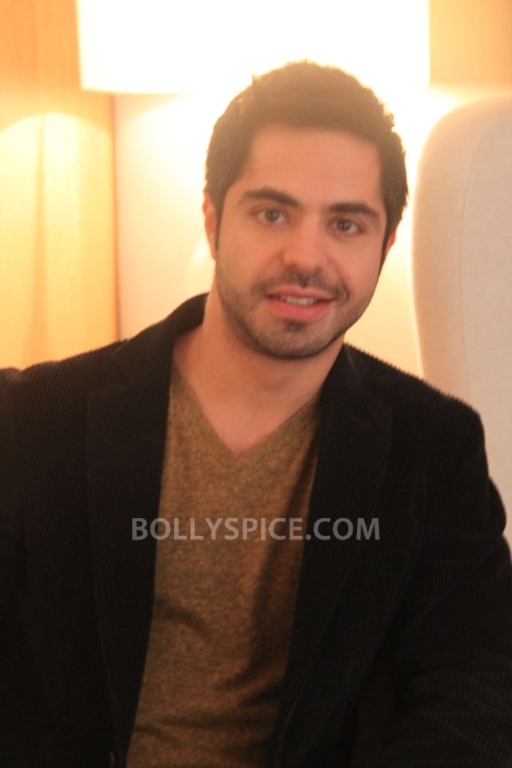 Playing the lead character is a young British-born American actor called Satya Bhabha. Film buffs may remember him as Matthew Patel from cult hit Scott Pilgrim vs the World. Born only a few years after the original book was written, Satya has read Midnight’s Children a number of times and has a strong family connection with it’s writer Salman Rushdie. BollySpice managed to catch up with him in London to ask him about the iconic book and working with acclaimed director Deepa Mehta. So, now you’ve seen it what did you make of the film? I think it’s wonderful. It’s a sweeping, moving, exciting adventure – a true epic. I also think it’s got an incredible amount of heart, it’s also idiosyncratic, in that it is weird in the right way. It has a sweeping, but yet gentle narrative structure, but then of course it is based on a Salman Rushdie book, do it can’t be that gentle! All of us reviewers are asked this same question: Have you actually read the book yourself? (Laughs) Yes, I have. First time I read the book was when I was about 10 years old and I’ve read the book quite a few times since and again over the years. It was a book that was very important to my family. My father’s a writer and a colonial theorist and has been pushing this book at me ever since I’ve been a little boy and I said fine I’ll read it. Of course I just fell into and I couldn’t stop. Have your parents seen the film yet? What did they think? Yes, they saw it in Toronto and it was really great, it was really exciting for them and for me to share it with them and they loved it. Did you have any discussions with your father about how true to the book it was? No, not really. I mean my father knows the book well and actually both him and Salman Rushdie are old friends from quite a few years ago. We discussed the shooting quite a lot, for example in the book Saleem has blue eyes, so I played with some blue contacts and then decided that they’re really not working partly on a technical aspect. They were very uncomfortable and were making my eyes look very dead. I remember calling my dad in a frenzy saying “Oh my God, they’ve cut the blue eyes!” and he assured me that it’s no big thing. The interesting thing is that when you see the film, it kind of sweeps you back into the world of the whole book, but you don’t necessarily pinpoint them. It feels at one with the world of the book, without necessarily being the book. It’s a tough role, how did you prepare for it? What went into it for you? There was a huge amount of preparation. I went around India, got in touch with the country in a way that I never really had before. My father’s Indian, but my mother’s Italian, so I had spent some time there, but not a serious amount of time on my own terms, outside of a family holiday. So when I heard I got the film one of the things that both Deepa and I were aware of was that I would need to spend some serious time there and develop a bit of a relationship with the country there. Absolutely, it was an amazing experience and will always remain with me. What about being directed by Deepa Mehta, what was that like? It was fantastic. She has got this incredible astuteness and emotional truth. She has a real laser focus and that was really exciting and comforting as an actor to know that the truth of your performance is really in your hands. There were also a lot of mainstream Bollywood actors in the film, what was it like working with them? I was little nervous at first. You hear horror stories and so think it’s going to be a disaster, but actually the cast was just phenomenal. They were incredibly generous, gifted and wonderful actors. Shriya Sharan who plays my wife in the film was just amazing and wonderful to work with and Shahana Goswami who plays my mother is just a completely phenomenal person and actress. So it was a really great honour to be able to work with these people, because they are people who are real stars in their own right and for them to agree and come in and do a film where they were not playing the lead roles and where they were playing more ensemble characters, was really excellent and speaks to the kind of artists they really are. With this being a good example, there are now quite a few Hollywood-Bollywood cross-productions taking place, do you see yourself do a Bollywood film in the future? I would love to, there are a lot of really interesting films coming out of India right now and I would absolutely love to work in that environment. I also think that, as you say, at this point the Indian film industry is really becoming a global thing and I would love to work in India more and also work in England. I just finished directing my first short film, which I wrote. That’s almost finished and so will hopefully be doing the festival rounds soon. There are some acting projects which are almost confirmed, but unfortunately I can’t talk about them at the moment, but maybe if we speak in about four hours time I’ll be able to share something with you! Finally, how do you think the younger generations of the Asian diaspora will take to Midnight’s Children? I really hope that they love it as much as I do. It’s sort of like an epic for all generations. It’s not like your grandfather’s movie. It has got a lot of colour, a lot of music, a lot of energy in it and also a lot of history that is easy to ignore. People really enjoy being reconnected with the history of their country, especially when it is told in such a dynamic way, so hopefully they will get a lot out of it. Thanks Satya, on behalf of BollySpice we really do wish you all the best with the release and with your work in the future. Midnight’s Children is in cinema’s from Boxing Day across cinema’s in the UK. Come back to check out our interview with Deepa Mehta and our exclusive film review.